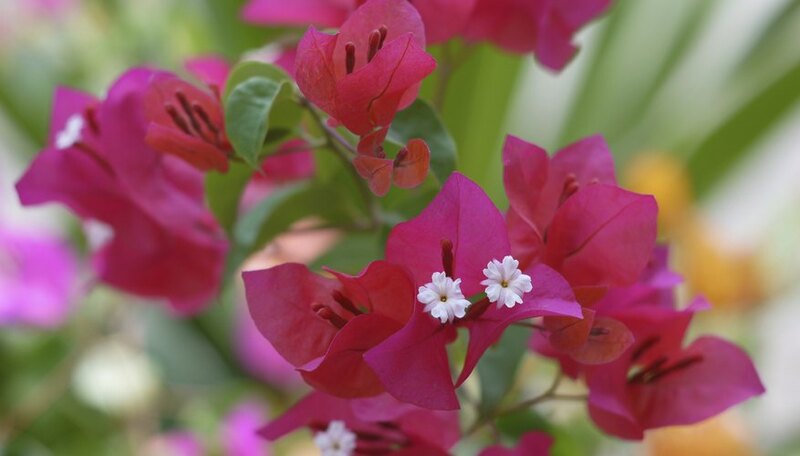 A member of the four-o'clock family, bougainvillea (Bougainvillea spp.) is a vigorous woody vine characterized by scores of papery flowers in shades of magenta, purple, sunset orange and white. It is hardy in U.S. Department of Agriculture plant hardiness zones 9 to 11. Though diminishing the beauty of this lovely plant is tough, some pests do a good job by eating its tender green leaves. The bougainvillea looper is a species of green or brown caterpillar about 1 inch long that thrives on all species of bougainvilleas, leaving behind heavily scalloped leaf margins. Thoroughly stir 4 teaspoons of Bacillus thuringiensis, a type of soilborne bacteria available at some garden centers, with 1 gallon of water and spray the entire plant evenly using a hose-end or pressurized sprayer. Repeat weekly until pest is under control. Always follow label instructions exactly. Bacillus thuringiensis has a short shelf life and degrades in sunlight, so store it in a cool, dry place inaccessible to pets and children, and use within two years. Avoid contact with skin and clothing. If you inhale or swallow Bacillus thuringiensis, contact the American Association of Poison Control Centers at 1-800-222-1222. The larva of various moths and flies are known as leaf miner insects. These insects burrow into leaves, causing winding tunnels and giving leaves a bare, skeletonized look before they drop from the plant. A severe infestation can kill the vine. Bougainvillea Growers International notes that contact pesticides are ineffective, as leaf miners feed inside the leaves. Instead, remove debris from around the base of the plant, as larva and eggs can overwinter there. Keep the planting area well-weeded, and mulch with organic matter to prevent new weeds from emerging. Slugs and snails nails tend to feed on the middle of leaves, although they sometimes work on the edges as well. Slugs and snails feed in the evening, thriving in damp conditions and leaving behind telltale trails of shining slime. Pick slug and snails off by hand in the evening and drown in soapy water or crush. You can create a physical barrier around your plant by spreading dry chalk, crushed eggshells or sharp cinders around the stem. Oak leaves also work well, since these pests dislike the tannin in the leaves. Plants that are stressed due to improper cultural care are more susceptible to attacks from pests. Bougainvilleas do best in bright, sunny situations with rich, loamy and well-draining soil. Water frequently to keep the soil moist, but not water logged or flooded. Watering in the morning will allow the plant to dry out before evening, discouraging slugs and snails. Prune away and destroy any dead, diseased or infested growth with disinfected pruning tools and keep the planting area tidy by removing organic debris. University of California Integrated Pest Management Program: Bougainvillea -- Bougainvillea Spp.